Remember what users want from your website! What do users want from your digital experience? We used the Hotjar user experience tool to place a poll on our homepage to find out what users want from the page. We then compared this with what was actually on the page. The Venn diagram above shows how so much of what was on the homepage didn’t match what users want from the page. You might think that some of these are so obvious that nobody in their right mind would not put them on the homepage. Don’t assume anything. This site is mobile responsive and the desktop team decided to hide the account login details for mobile users without informing anyone. They wanted to push such users to download the app. What they hadn’t considered though was that the app didn’t allow users to amend their account details or validate personal details as part of know your customer (KYC). This meant users were being informed in the app to logon to the website to complete KYC but couldn’t complete this task as the login box was hidden. This is what happens when people work in silos and it’s often down to conversion optimisers to break these down. Find out what users want! 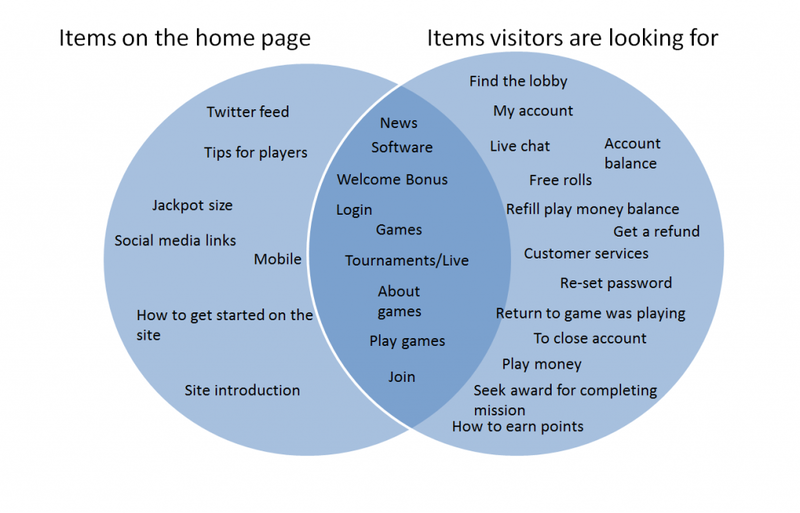 So, what do users want from your website or app? Well, they normally come to your site to complete a task and if we don’t understand these tasks then we are going to struggle to deliver what they are looking for. That’s why it’s important to gather user feedback and there are plenty of online voice of customer tools that allow you to do this very easily. Remote usability research tools can also be used to explore what is missing from a page. Use follow-up questions to ask participants what was missing from the page or user journey. Also look at real user journeys using your web analytics tool to identify if a large number of visitors are navigating to your About Us page or other non-transactional pages. This may indicate there is insufficient information on your landing pages about your reputation and what you offer. User experience tools which record real users navigating on your site are also very useful. Schedule time to regularly watch browser recordings to see if users are finding your site intuitive or not. Are they clicking on assets that are not clickable, but should be? Don’t assume you know what users want from your site or app. Click heat maps can also be useful in identifying where users click and if they are trying to click on an asset that is not clickable.